Powder Into Liquid Disperser (DISPERSHEAR) | ARDE Barinco Inc. Tricky powders effectively dispersed into liquids, carbomers, Xanthan Gum, CMC, batter mix, guar gum, pre-gelatinized "cold water" starches, polyethylene oxide, HEC, gum acacia, locust bean gum and alginates. 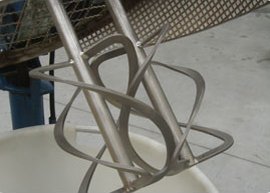 Dispersion of difficult fine powders into liquids is the strength of the ARDE Dispershear. Only the Dispershear from ARDE Barinco lets you control the feed rate of solids as well as the flow rate of liquids. The result is a remarkably efficient system that produces smooth, uniform dispersions with no waste and no agglomerates. 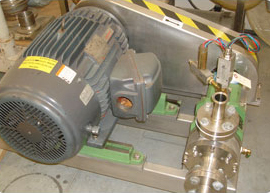 The Dispershear evenly incorporates fine powders that can be difficult to disperse with conventional systems. And its one-pass operation won't harm long-chain molecules or other shear-sensitive materials. 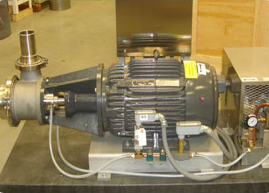 *The D-6006 uses a 20 HP, 3600 RPM 6" diameter smooth mixing impeller to produce 50 feet of water vertical discharge head at 40 GPM inlet flow rate. The key is the variable-speed auger running along the bottom of the solids holding hopper. 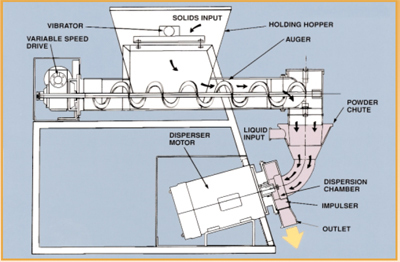 By adjusting the auger's speed, you control the rate at which solids feed into the powder chute-slowly for fine powders, faster for maximum productivity. The liquid also enters the powder chute at the rate you specify. Because the liquid flow washes the walls of the powder chute, the problems of solids buildup and plugging are eliminated. The entire mixture is washed down into the dispersion chamber. 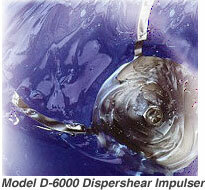 Housed inside the dispersion chamber is the low-shear Impulser. 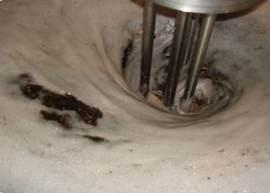 The centrifugal force created by the Impulser abruptly changes the direction of the entering mixture, subjecting it to both mechanical and hydraulic low-shear dispersing. The swirling action created inside the dispersion chamber provides fast mixing and ensures uniformity. The new product, smooth and consistent, is pumped out the discharge port. Residence time in the dispersion chamber is a mere 0.2 seconds, requiring very little energy. The Dispershear can handle a wide variety of solids (including light powders such as flour, Xanthan Gum and Carbopol) and liquids (water, solvents or any other liquid pre-mix). It can produce low-viscosity suspensions, high-viscosity dispersions, or anything in between. 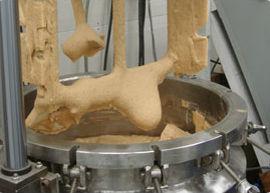 And it mixes large or small quantities continuously or in batches. This versatility makes the Dispershear perfect for a variety of industries including food, chemical processing, pharmaceuticals, cosmetics and toiletries, textiles and coatings. 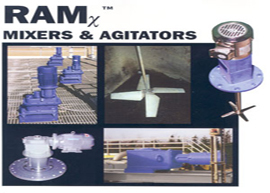 The Dispershear mixes faster than conventional mixers. That's because the powder particles enter the fluid almost instantly, and are dispersed quickly by the remarkably efficient Impulser. That leads to increased production in less time-translating into reduced energy costs. Material savings are realized because there are no lumps to filter out. Labor costs are reduced too, because the variable speed auger eliminates the need for manual feeding of fine powders. The Dispershear comes apart quickly for easy cleaning with minimal down time. Disperse 5% Carbopol 940 carbomer into DI water to form a hair-care gel product. Wet out 3%-5% Xanthan gum into water at 25 gpm for a "lite" syrup. Disperse 2.5% propylene glycol alginate into water as a carpet printing dye stabilizer. 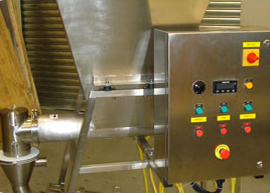 Disperse 42% batter mix at 100 pounds per minute for high volume batter french fry potato lines. Disperse 5% Xanthan gum/pre-gelatinized starch synergized mixture into water for low calorie salad dressings. Disperse 3-5% guar, CMC, and locust bean gums into canned pet food gravies. Disperse 12% Carboxymethylcellulose into water as a stabilizer an a xanthate rayon process. Disperse 18% potato starch as a strength aid in toilet tissue paper manufacturing. Disperse up to 40% by weight Titanium dioxides and other pigments for specialty coating application. Wet out 10% pregelatinized starch and Xanthan gum for hot sauce products. Disperse up to 15% polyethylene oxide in water for pharmaceutical gel patches. Disperse 55% Polydextrose in one pass and 80% in the second pass for low-calorie candy products. Disperse CMC at 6.5% into water or Sorbitol for toothpaste manufacture. Disperse Micro crystalline cellulose, pregelatinized starch, and Xanthan gum into water for NO FAT mayonnaise. Disperse 6% alginates into water for textile printing paste.